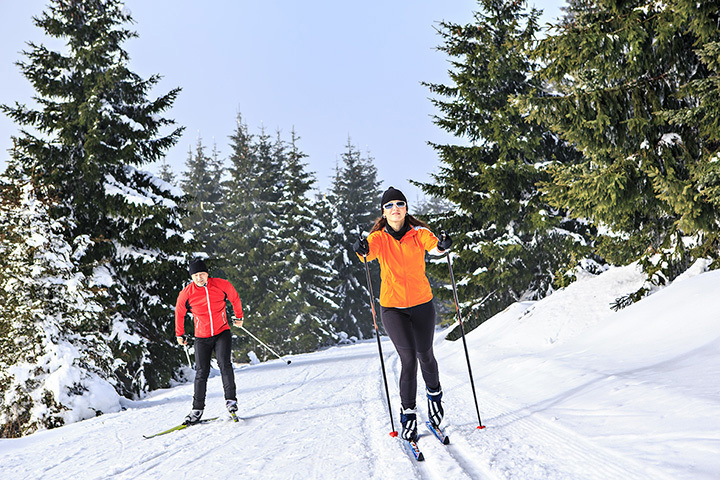 Cross-country skiing is a sport that is both aerobic and serene, with skiers gliding along trails of quiet, snow-blanketed forest. With New York State’s cold winter climate, ample snowfall, and diverse terrain, it’s an ideal state for cross-country skiing enthusiasts. Here the 10 best cross-country skiing trails in New York. With 35 miles of trails, plus equipment rentals and experienced staff on site, Mohonk Mountain House is a cross-country skier’s paradise. Check out views of the Shawangunk Mountains or take in the scenery along the many ponds, streams, and hills of the property. Perfect for both beginners and experienced skiers, Fahnestock offers over 11 miles of groomed and mapped trails to explore. The terrain is easy, and there is also a sledding hill and an outdoor fire pit. Designed and owned by a former Olympic skier, Lapland Lake is an Adirondack cross-country skiing dream come true. The park’s 30 miles of trails were designed with serenity in mind, with many of them designated one-way only to decrease traffic. At 4,315 acres, Westchester County’s largest park has a lot to offer cross-country skiing enthusiasts. The park has over 40 miles of groomed and maintained trails that are perfect for families. Entry to the park is free, but a trail pass costs $10. This Adirondack cross-country ski center offers the complete experience, from equipment rentals and trail maps to season passes and lessons. Guests of the park enjoy 12 miles of clearly marked and groomed cross-country ski trails. Less than 30 miles from New York City and overlooking the Hudson River, Rockland Lake State Park is convenient and beautiful to explore. The Hook Mountain park comprises more than 1,000 acres and contains ample trails for cross-country skiing. Over 35 miles of snowy, forested trails are available for cross-country skiing each year. The trails are both groomed and backcountry, and equipment rentals are available. The trails at Letchworth State Park, also known as “the Grand Canyon of the East,” are ungroomed, but that makes the experience more of an adventure. The park boasts 50 miles of cross-country skiing trails, including the Finger Lake Trail, which traverses the east side of the gorge. Adjacent to the Mohonk Mountain House is Minnewaska State Park Preserve, with 32 miles of skiable, groomed trails. The challenging landscape makes for an exhilarating workout. Trail passes cost $10. An Onandage County park, Highland Forest provides cross-country skiers with 40 miles of trails. Twenty of them are groomed and maintained by the park, and the terrain is good for all ages and skill levels. View more New York Cross Country Skiing Trails.